A Potential Supreme Court Case in the Making: How Safe of a Harbor is the EPA’s Silvicultural Rule? Logging companies commonly build a series of culverts and ditches to divert storm water and sediments away from the dirt transport roads the companies use for log transport. These logging companies rarely obtain any sort of permit, even though the Clean Water Act (“CWA”) requires companies that artificially introduce pollutants into water ways to obtain a permit. CWA-regulated pollutants include a variety of substances, even natural sediments such as those found in storm runoff–these pollutants actually have very real effects on ecosystems when artificially introduced into the wrong aquatic environments. For three and a half decades the EPA, which enforces the CWA, has allowed these loggers to divert storm water, and the accompanying mass of sediment, without triggering the CWA’s labyrinthine permitting requirements. The EPA has historically avoided any legal backlash via a regulation known as the Silvicultural rule which exempts categories of activities from the CWA’s permitting requirements. Although a storm water runoff exemption might seem a small concession, this rule is part of a historical cessation of forest regulations to the states. According to many scholars, the EPA’s “respect” for state sovereignty has had devastating impacts on the environment. Recently, the 9th Circuit pushed back on the EPA’s liberal treatment of state forests by holding that the Silvicultural rule could no longer be the EPA’s safe harbor, forcing the EPA to get involved with environmental regulation in state forests, at least when it comes to artificial storm runoff. Early last year, in Northwest Environmental Center v. Brown, 640 F.3d 1063 (9th Cir. 2011), an environmental group brought claims against the state of Oregon and several lumber companies alleging violations of the CWA. The plaintiff claimed that the companies were violating the CWA by diverting storm water and sediment from logging roads into rivers and streams, and thus creating an un-permitted point source of pollution. At first blush, the law seems to clearly favor the environmental group’s position. 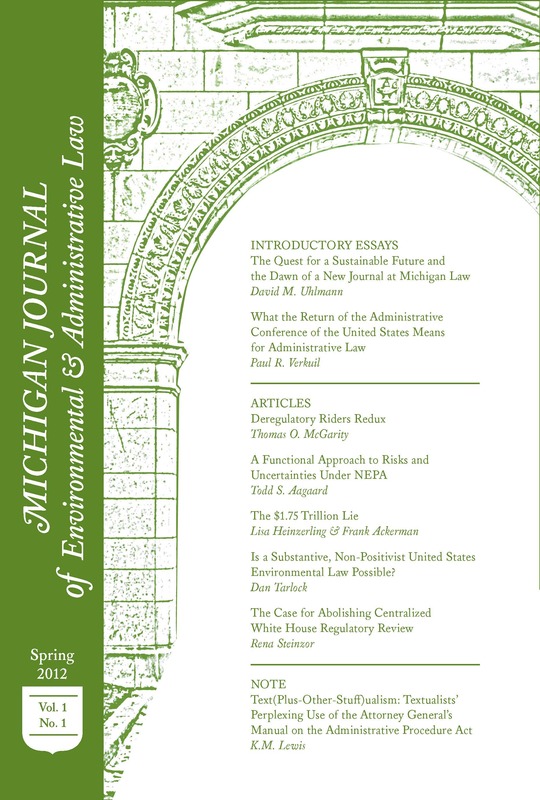 The CWA requires permitting for point sources that pollute waterways, and the clear language of the statute seems to unambiguously encompass artificially controlled runoff.However, the defendants would appear to be within the safe harbor of the “Silvicultural” rule.In fact, for 35 years, the EPA has left regulating forest runoff to the states, using the Silvicultural rule to define roads like those at issue in Northwest as an unregulated non-point sources. A brief understanding of the Silvicultural rule’s rocky history is needed to understand the current debate. The first version of the rule was struck down by the D.C. District Court as beyond the EPA’s statutory authority.The court held that the power to exempt point source discharges,categorically, was beyond the authority statutorily granted to the agency. The court looked to the CWA, finding that the statutory language and legislative record foreclosed categorical exceptions under even the great deference afforded agency interpretations: the EPA must require permits for anything that meets the definition of a point source pollutant. Perhaps most prominently, Northwest’s holding can be seen as a pushback on the historically broad powers the EPA wields. Courts generally give agencies wide discretion in carrying out the details of their delegated duties, and this case might signal a trend of EPA constraint. More specifically, how much control and discretion the EPA has over permitting, and should have, is a highly contentious issue. Starkly reversing a 35-year practice, with potentially enormous impacts, is a bold judicial pronouncement regardless of the grounds. This case is also important because of the enormous costs faced by both the government and private companies, as well as the environmental stakes. Under Northwest‘s holding, a plethora of private and public entities would have to procure CWA permits anytime water is artificially diverted. This could be an enormous burden.On the other hand, the deleterious effects of artificially diverted runoff are not mere conjecture or rumor mongering: it is in fact a well-documented threat to our environment. Finally, one other factor that the Supreme Court might consider is a federalism issue. Historically, the states have had a robust role in regulating their forests and waterways. In fact, state forests are one of the last resources the federal government has been careful to only indirectly regulate through statutes such as the CWA and the Endangered Species Act.Arguably, if Northwest is upheld, the federal government will be taking a much more direct hand in forest management. This is likely why the application for Northwest’s certiori was accompanied by amici supporting review from 26 states, including Michigan. There are other potential administrative law challenges to be made to the case which might be successful, and the applications for certirori explore these in detail. For example, the petitioners argue that the Silvicultural rule should not be subject to challenge because the CWA requires rule challenges within a time period long passed. Northwest quickly dismissed this argument on the grounds that the published rule was ambiguous as to the channeling issue, but there is significant room for argument. Although the Supreme Court has not yet granted certitori, neither have they denied it. In fact, the Court recently issued an order requesting the Solicitor General to opine on whether review should be granted. Considering that half of the states have submitted amici in support of review, there is a significant possibility that the Court will be hearing this case. —–Joe Regalia is the Online Content/Technology Editor for MJEAL. He can be reached at regaliaj@umich.edu. The Northwest case discusses the classification of artificial runoff as a point discharge in depth. Northwest Environmental Center, 640 F.3d at 1073. Natural Res. Def. Council, Inc. v. Train, 396 F. Supp. 1393 (D.D.C. 1975) aff’d sub nom. Natural Res. Def. Council, Inc. v. Costle, 568 F.2d 1369 (D.C. Cir. 1977). See the EPA’s proposed rule. 40 Fed. Reg. 56932. The Northwest court quotes the relevant sections of the EPA’s rules, noting that the EPA comments to the revised rule state that “a proper interpretation of the FWPCA … is that not every ‘ditch, water bar or culvert’ is ‘mean[t] to be a point source under the Act [FWPCA].’ Nw. Envtl. Def. Ctr.,640 F.3d at 1076. Nw. Envtl. Def. Ctr., 640 F.3d at 1077. See the EPA’s webpage exploring the dangers of sediment in waterways at http://water.epa.gov/polwaste/sediments/cs/index.cfm. See Blake Hudson’s discussion of the potential federalism issues present at http://lawprofessors.typepad.com/environmental_law/2011/12/potential-supreme-court-case-northwest-environmental-defense-center-v-brown-a-cwa-permit-required-fo.html.